When you fly to Iran these days the planes are a little more full than before. Business travelers are making their way to Tehran scoping out opportunities, hoping that sanctions might be lifted soon. More tourists also appear to be on the planes coming from Frankfurt, Rome, Istanbul and the few other places that have direct flights to Iran. The Iranian government says it expects a 6.6% rise in the number of tourists for 2015. President Hassan Rouhani's administration has made tourism development one of its major policy goals in a drive to revive an economy buckling under sanctions. "We divide our tourists into four groups," Iran's Vice President for Tourism and National Heritage Masoud Soltanifar told me in an interview. "We have a lot of religious tourists who come to visit our many shrines. Then we have a lot of medical tourism. But we also have a lot of cultural and nature tourism." Soltanifar acknowledges that the tourism sector in Iran still has a long way to go. He blames international sanctions for some, but not all of the woes. "In 10 years time we want to have 20 million tourists here in Iran and are expecting a revenue of about 30 billion dollars. "This is our goal and we have a program to achieve that goal. Of course the lifting of sanctions would certainly help us." He says Iran must do more to invest in its infrastructure. "We need more four and five star hotels to accommodate more visitors here and a lot of investment will be necessary in the coming years." We embarked on a road trip from Tehran to Iran's second largest town of Shiraz. In many ways Shiraz embodies the wealth of tourist attractions in Iran. There are several unique religious sites, like the Vakil and the Nasir al Mulk mosques. Nasir al Mulk, also known as the pink mosque, was built in the 19th century. 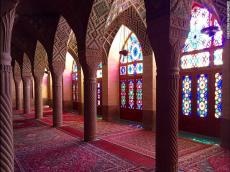 It's unique because of it use of pink and red tiles and colorful windows that create an ambient light effect on the walls and the floor of the main prayer room, especially in the dawn hours. There's the castle of Karim Khan, who used to be the governor of this area in the 18th century. And there's Eram garden, an historic and elaborately planned horticultural attraction now run as a botanical garden by the University of Shiraz. The tomb of Hafez, probably the most influential in Persian history, is also popular with visitors. The tomb is embedded into a garden that also has a cultural learning center where students learn to interpret Hafez's poetry. At the tomb, we met some of the few Westerners we saw here during our trip. They told us they'd been traveling through Iran for several weeks and were enjoying their stay. "People are very inviting, welcoming," they told us. "There is a great infrastructure. It's really easy to travel by bus." But many Westerners still have concerns coming to the country. Some worry about security and others about the political situation. One problem for foreign visitors is that Western credit cards are not accepted as Iran is cut off from international money transfers by international sanctions. One reason why the government hopes these will soon be lifted. As we departed Shiraz we made sure to visit one of the most famous places in all of Iran. Persepolis, the ancient imperial ceremonial capital of Persia. Here too, we found tourists, but most of them were Iranian. The archeological site itself is remarkable, with its many temples and former palaces, that lay in ruins since they were destroyed by the army of Alexander the great around 330 BC. The columns and frescoes are made mostly of black and gray marble that was mined in quarries around the site. Iran is a country with much to offer tourists in terms of nature, culture and religion. International negotiators currently working in Vienna to strike a deal over Iran's nuclear plans will have a lot of influence on whether more tourists from around the world will be able to experience them. Discover secrets behind Fire Tuesday! Year of Earth Pig. What stars hold for you? What is Best Gift Ideas for New year?